Silverstone Auctions will be offering 77 stunning cars for auction at its May Sale, taking place at The Wing, Silverstone circuit on 13th May. Of particular note is the number of low mileage, the original UK supplied, right hand drive cars on offer from the likes of Aston Martin, Ferrari, Porsche and Jaguar, some at public sale for the very first time. As a speciality for the auction house, 17 best of breed Porsches will be on offer including a very rare and special 1993 Porsche 911 (964) Turbo ‘S’ Leichtbau. Estimated at between £475,000 and £575,000, the highly collectable car is, according to its Porsche Certificate of Authenticity, chassis number 51 of only 86 examples ever made. Coming from single family ownership for the last 52 years, a 1961 Porsche 356B Cabriolet is estimated at between £100,000 and £120,000. Seven Aston Martins will also be going under the hammer at the auction. 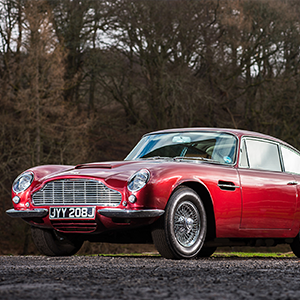 Headlining the selection is a 1971 Aston Martin DB6 MKII Vantage, estimated at between £325,000 and £375,000. Owned by none other than two-time BTCC Champion John Cleland, the car is one of only 34 examples made and an original right-hand drive, matching engine and chassis numbers, factory built Vantage DB6 MKII with a manual gearbox. If something Italian is more your thing then 14 fabulous Ferraris are also up for auction. One of Ferraris rarest grand tourers, a 1972 Ferrari 365 GTC/4, one of just 31 UK right-hand drive examples, is estimated to sell for between £230,000 and £260,000. A right-hand drive 1997 Ferrari F355 GTS, with Rosso paintwork and Crema interior and a manual gearbox that has covered just 17,500 miles from new, is estimated at between £65,000 and £75,000. With nine examples on offer, Jaguar E-Type fans are well catered for. An original UK, right-hand drive 1974 Jaguar E-Type Series III V12 Roadster, with just 37,000 miles from new, is estimated at between £85,000 and £95,000. Straight from the ownership of Rock ‘n’ Roll royalty is a 1960 Bentley S2, the property of Sir Ray Davies of The Kinks, estimated at between £25,000 and £30,000. 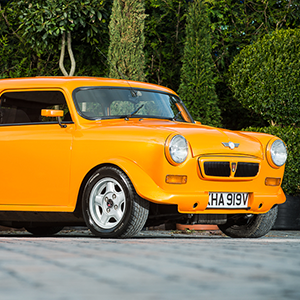 Something a little different is available in the form of a 1990 customised Mini ‘Orange Crush’. The car, offered at no reserve, is a unique and award-winning, superbly crafted development of a 1979 Mini 1000. Those looking to go ‘back to the future’ may be tempted by the 1981 DeLorean DMC-12, estimated at between £28,000 and £32,000. A very fine example of the model, it has had just two previous owners, features a manual gearbox and has covered just 26,000 miles.